The sun is beaming and the birds are chirping merrily. What a perfect day for fishing! Sun too bright? Fret not for fishing sunglasses such a the polarized one will aid you in scouting for fish under water. You are all set to begin with a fishing rod, bait and lures at hand. However, have you given thought towards purchasing a tackle box for fishing? You may be like most whom thrusts everything into a single bag, but believe me, having a tackle box enables you to be much more organized and prevent the lines of your fishing rod from tangling up with the hooks and baits. Curious to know what are the criterias that make up a the best tackle box for fishing? Don’t worry about the overwhelming information because we got it all sorted for you! Keeping fully in mind that most tackle boxes come in rather large sizes, you will want to be sure to go with one that is lightweight and portable. Being large does not necessarily mean the tackle box has to bulky and heavy because it will be quite hard to lug around especially if you are an avid fisherman and travel often to new fishing sites. Also, think about all the other equipment that you will have to carry, do you really want the added weight of a troublesome tackle box? Surely not. Lucky us for in this day and age, most of these boxes are manufactured to be as light as possible. As with any product, as a consumer surely you would expect it to be sturdy and last a long time especially if you paid huge bucks for it. Same case here. A tackle box needs to be sturdy and feel firm to the touch. It should not break open at the slightest bang and even survive several drops to the ground. Also, your fishing activity may not only take place on dry land but on boats as well. Therefore, the tackle box should be able to withstand the sprays of either freshwater or salt water. Thus, do not go for one that is made of any kind of metal as overtime it will have the tendency to corrode and rust. A good box is more than capable of lasting you for several years if not more. There are tons of types of baits and lures out there so if you are the type of person that collects all, you will surely need a spacious tackle box. In fact, think of a tackle box like you would of a tool box. Compartments and divisions are necessary to keep order and make sure everything is neat and organized. This would also enable you to easily acquire what you are looking for. Tackle box these days come in different types, some have trays, some have plastic compartments and etc. Thus, rest assured you will definitely be able to find one that suits you best. In fact, some of these compartment dividers are even sold separately and you can a hold of them online. Having a great many number of compartments is one thing, but it should be easy to use as well and by that I mean, easily accessible. The product itself should be portable and convenient for storage and travel. Moreover, the handles and clasps should be in great working condition and not cause any difficulty to the customer in any way as the buckles and clasps can be tricky to manage sometimes. Considering that the buckles and clasps will be used every time a tackle or bait is needed, they should not loosen or worse case scenario, break off which is quite common in cheaply made tackle boxes. Tackle boxes are not complicated like certain devices and machines. Therefore, special features and qualities are needed to market the product and distinguish it from the rest otherwise all boxes would just end up being the same. Perhaps one of the products comes in a great rugged design to withstand uneven terrain or another one has a non slip handle that gives the fisherman a better grip while carrying it around. These are just to name a few examples. There are many other unique features available and at the end of the day provide a great fishing experience for you. Warranties are an added plus and very welcome as some of these tackle boxes can be expensive. Size & weight is rated respectively. Durability is rated from very bad to very good. Storage & Compartments is rated respectively. Ease of use is rated from very hard to very easy. Special features is rated respectively. From the model itself you can already see that this tackle box is fairly large and for that size, 2.5 pounds is not heavy at all. In fact, it is super lightweight and comes in a great design with the color blue and gray to match. In fact, this product is even small and light enough for a young child to carry as it’s size is no larger than that of a shoe box. In terms of durability, it holds up pretty well and is perfect for long term use which is no surprise as it is made out of great quality plastic. Moving on to the storage and compartment aspect, this Ready 2 Fish model comes with 2 trays that are hinged to the box thus they are not removable. On these trays, you will be able to fit in 136 pieces of assorted tackle. Basically this is how it works,the two shelves provide lots of organized storage with tons of dividers and the shelves slide back almost like stairs to open up the whole part of the box to be filled and then slide back to sit on top.The bottom compartment is about 4 inches deep hence you will enough room to store large objects. The sizes of the compartments are fully adjustable as well. Moreover, this solid box is very portable and convenient to use. The main latch works great and secures all the items inside from getting scattered everywhere, so it is pretty heavy duty you might say. As for the special or added features, it comes with jigs, hooks,bobbers and sinkers plus a handy fishing guide with helpful tips for a beginner or novice. Besides that, we’ve made a compilation of fly fishing tips for beginners right over here. As for the disadvantages, there is only one and that is the tackle box comes empty, not with the 136 pieces of tackle that customers were hoping to get as well. 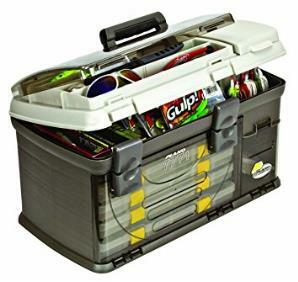 This tackle box does not come in the conventional shape of a tool box. Instead, it comes with a unique design of it’s own that sets it apart from the rest. The rust and ivory color adds to it’s appeal. Weighing at 2.9 pounds, it is still light and portable. Do keep in mind however that this fishing box is smaller than the rest of the similar products. It is certainly very durable as it is made in the USA and made using high quality components. Furthermore, bulk storage is available under the lid and there is a small 4-by rack system with Four 2-3500 Prolatch boxes included. Each drawer has removable partition walls . Here are some more additional information, there are about 15-30 adjustable dividers and each of the trays are about an inch deep. So, you will be able to store as much tackle as you would like seeing that space shall not be a problem. In terms of ease of use, this fishing gear is extremely easy to handle and contributes to a great fishing experience. The drawers can even be easily marked to indicate what they contain. As for the special features, it comes with a limited lifetime warranty, how cool is that? The only 2 flaws being would be, the handle has little nubs at the bottom that are supposed to engage in groves on the lid but because the handle width can vary, the nubs can actually make the handle eject itself from the holes. Secondly, the front door when dropped gets in the way of inserting and removing the lowest box. Overall however, this is a great tackle box that is very affordable. This tackle box is definitely on the smaller end, thus if you are a beginner or a child/ adolescent then this is a perfect match for you. In terms of durability, it is pretty good and does not feel flimsy or cheap. Also, it has a very simple design and since it is mostly meant for beginners, there is only one tray included, which is removable if you have bigger things to store. As for the ladies, you will be happy to know that this tackle box also comes in hot pink! In terms of ease of use, it is fairly easy to operate and great for travelling purposes. It is suitable for casual fishing and holds just what you need especially since beginners are not particularly out to get whales and trouts for their first catch. The box also stays firmly shut. Moving on to the special aspects, 88 pieces of basic tackle is already included (bobbers, fish holder line, hooks, weights and fish hook remover tool) and for such a low price, seriously what more can one ask for? The hooks that they give you come in various sizes. The weights come in a little package and you need a set of pliers to clinch them to hold. As for the bobbers, they come in orange and green with yellow and they are the small round types and they are very good. Regarding the disadvantages, there is only one major one and that is, please take note that the basic tackle is not exactly of the highest quality thus it may affect your fishing performance. So, you may have to purchase tackle of your own if the ones included are not up to your satisfaction. This tackle box certainly means business and is largely targeted towards professional or avid fisherman because standing at 5.3 pounds, this tackle box can hold a lot of stuff of which most are vital towards the pros. It is certainly heavy duty as it is manufactured from top quality materials and can withstand all weathers not forgetting to mention that the tongue-and-groove construction between lid and base contributes towards a water-resistant design . Moreover, the over sized extra-large 3-tray features up to 37 compartments and two clear lid covers on top tray that keep small items from moving around inside box. Also, removable dividers are included for enhanced storage capabilities. As for tray depth, it actually varies for better capacity options. As for the convenience, this fishing gear is super easy to use and no major hassles are involved. In fact, this box even allows you to secure it with a small lock. Unfortunately, there are no special features, not even tackle included. Further disadvantages include, overtime the back plastic hinge often unsnaps itself and the lid separates from the box at times and has to be snapped back on. If you are willing to overlook the minor flaws, for the great price, this is a solid box. Here is another great product from Plano. This model here is much heavier than the previous one, thus it is more suited for bulk, heavy storage. It comes in a simple black and white design and overall is pretty durable especially since it is capable of carrying a heavy load with ease. Moving on, there is more than enough room for spacious bulk storage and includes a Plano 4 utility system( 4, large, slide-in trays). The 3 bait racks are removable for separate access. Top access is available with the DuraView lens. Here is exactly how the tackle box is structured, the top opens and then there is another top section that opens. The lower part has 4 plastic boxes and separators that you can insert to fit your needs which means there is tons of room for spare spools of line, reels of your choice and etc. In fact, you can even use this box to carry food,water and some survival gear.On top of that, this Plano tackle box also comes with a nameplate order form which means that there is a place to put a name on it so the customer can personalize it according to their needs. Also, this solid box poses no problems in terms of convenience an ease of use and as for the special features, a limited lifetime warranty is available, so be sure to snap that up. There are no major flaws to this wonderful product. I certainly hope this article proved to be of help in your efforts to purchase a good tackle box. Also, don’t forget to take a look at the comparison table for better clarity. Try checking out our reviews for fishing backpacks which helps to store all your important fishing gears as well. Happy fishing folks!